Previously - if you wanted to edit the theme colors in a document, you had to first find your way to the color editor by selecting an object and then choosing to change its color. Not really helpful if you wanted to edit the colors of the whole document. 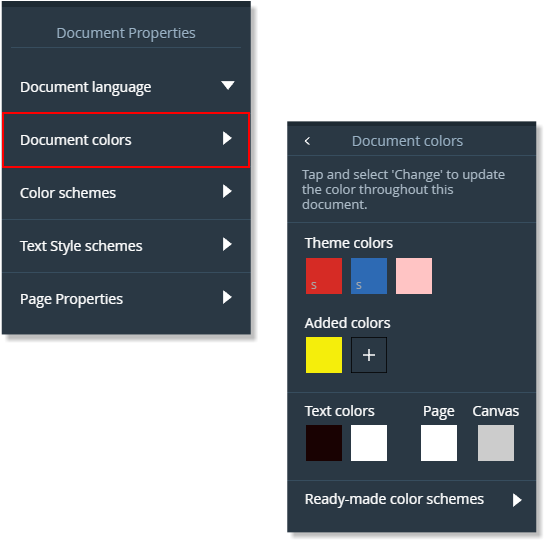 But now there's a new Document colors option on the Document Properties menu which opens a color panel showing all the current document's colors. All non-subscription users are now entered into a free 30 day trial of the Premium version on sign-in. We now support anchored and embedded objects inside repeating objects. This means for example that anchored comments can now be used with repeating objects and repeating headers can now contain embedded graphics. Instagram Stories (new category) - "Mexico", "Application", "Business"